Larger than Life: Lucy the Elephant ~ The History Girl! For over 130 years, an elephant has graced New Jersey's coastline, watching the ebb and flow of the tides, scores of families spend their summer vacations at the shore, and serving as witness to the changes due to erosion from nor'easters and hurricanes countless times. Lucy the Elephant, the world's largest elephant-shaped structure, located in Margate City, rises six stories above the beach and has served many purposes, including a real estate office, tavern, private cottage, and most notably, a roadside attraction. Lucy was conceived and built by James V. Lafferty of Philadelphia in 1881. Lafferty was an Irish-American engineer and inventor born in Philadelphia, Pennsylvania in 1856. Lafferty came into the possession of a number of lots in the area south of Atlantic City. These sandy dune lots were covered with scrub pine, dune grass, bayberry bushes, and a few fishing shacks. The only access to this barrier island was by crossing a tidal creek at low tide. In order to attract prospective buyers to his property, he conceived the idea of building an attraction. He received Patent Number 268503 from the U.S. Patent Office, on December 5, 1882, giving him the exclusive right to make, use, or sell animal-shaped buildings. Originally named "Elephant Bazaar", Lucy was designed by Philadelphia architect William Free and built in 1881 by a contractor out of Philadelphia. The building is 65 feet tall, 60 feet long, and 18 feet wide. It weighs about 90 tons, constructed with nearly one million pieces of timber, 8,560 ribs or arches, 200 kegs of nails, and 12,000 square foot of tin. The interior of her body was built as a large room with Gothic Revival style woodwork and a number of small closets around the exterior walls. Lucy contains twenty-two windows and two doors in her hind legs. A large howdah on top serves as a viewing platform and a large glass window on top of the howdah allowed light to filter into her body. She was originally billed at $25,000 to construct, but as she neared completion, the cost rose to $38,000. Lafferty would bring prospective clients to Lucy, which also served as his real estate office, and show them available lots for sale from the howdah. Selling land became very time consuming and the investment was no longer profitable. Lafferty offered Lucy for sale in 1887. Anton Gertzen of Philadelphia purchased the Elephant. In the summer of 1901, the first tours of the Elephant were led by Hedwig (Hattie) Pfeil, the family nanny. Tickets to tour Lucy cost 10 cents and were purchased in a small ticket booth located on the inside of her left rear leg, beside one of two spiral staircases that ascend to her body. In those first few years, many notable visitors were recorded in the guest register, including opera and stage stars, foreign dignitaries, and even a young lawyer named Woodrow Wilson! Anton died in 1902 and his Margate properties were divided amongst his children. His third son, John Gertzen, purchased the elephant structure and other properties from his mother. It is believed that John's wife, Sophia, is responsible for the name "Lucy" and no explanation for that name was ever given, but it stuck. The interior of Lucy the Elephant. In 1902, a doctor and his family leased the building as a summer home from the Gertzen family. Lucy's main hall was converted into four bedrooms, a dining room, kitchen, and parlor. A small bathroom was installed in one of the closets. The following year, Lucy began life as a tavern. However, rowdy patrons kept knocking over oil lamps used for lighting, nearly burning down the building in 1904, thus ending that venture. John Gertzen died in 1916, leaving Sophia with their two young children. In order to supplement their lost income, Sophia opened a tourist camp, which turned into a tent city until city officials banned the erecting of tents on the beach. A large Turkish Pavilion that had been situated next to Lucy was converted into a boarding house. In 1928, a violent storm blew off Lucy's original ornate howdah. It was replaced by a simpler version. A new howdah, rebuilt to the original specifications, was installed during restoration in the 1990s. After Prohibition, the Pavilion was converted into a beer garden and Sophia eventually established the Elephant Hotel in the building after World War II. Sophia died in 1963 and her children, Caroline Bonnelli and Joseph F. Gertzen, continued to operate the business, the hotel, Lucy as a tourist attraction, a refreshment stand, bathhouses, and small rental cottages until 1970. Lucy the Elephant and the Turkish Pavilion building. By 1969, Lucy's owners were getting ready to retire to Florida and sell the property to a developer. That same year, Edwin T. Carpenter and a group of Margate citizens formed the Margate Civic Association in order to find a way to save the aging elephant from the wrecking ball. In a deal struck between the Gertzen family, the new landowners, and Margate City, Lucy would be moved to a piece of town-owned property two blocks south of her current location. The moving expenses would be borne by the Association and as per the agreement, moved within thirty days to her new home. It was determined by an architect that although she was badly deteriorated on the exterior, her interior support system was still stable and capable of a move. The move and new foundation would cost a combined $24,000. The committee went door-to-door raising funds but came up short $10,000. Volunteers Josephine Harron and Sylvia Carpenter signed a personal note with the help of an anonymous co-signer to provide the remaining funding for the move. Lucy was moved on July 20, 1970 but not without road-bumps. Three days before the move, a court injunction was filed by the Atlantic Beach Corporation, citing that relocating Lucy would lower property values. At the urging of concerned citizens, a judge convened court on a Saturday and sided with the Civic Association. Finally, on the morning of July 20, after a late-morning fog delay, Lucy began her move two blocks south to her new home, with news crews, reporters, and onlookers cheering as she was pulled by a yellow pickup truck. Seven hours later, she arrived at her new home on the beachfront. Once secured, the arduous task of paying back the loans for her move began, in addition to raising money for her restoration. 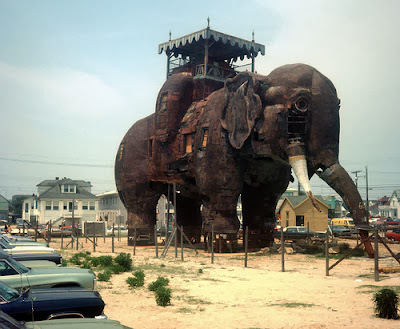 Lucy the Elephant awaiting restoration, 1970s. Lucy opened for public tours during the summer of 1974. She was listed on the New Jersey and National Registers of Historic Places and in 1976 became a National Historic Landmark. A small building formerly used by the Camden and Atlantic Railroad in the 1880s was moved to the site to use as a gift shop and an ornate Victorian fence was placed around the edge of property. Since the 1970s, Lucy's restoration and maintenance, as with any historic structure, has been ongoing. Within the past few years, her interior has been fully restored, allowing visitors to see the world's largest elephant as she was originally designed. Lucy wasn't the only elephant to be built in the United States. South of Lucy, in the now washed-away Borough of South Cape May, was another elephant-shaped building called "Light of Asia." Built in 1884, it was forty feet tall and owned by Theodore Reger of Philadelphia on land belonging to the Neptune Land Company. Just as with Lucy, stairs were installed in the hind legs and the front legs boasted concession stands. However, this elephant was not a financial success and entrance fees did not cover the $18,000 it took to construct. The Mount Vernon Land Company acquired the elephant in 1887 and used it to advertise real estate in the area. By 1900, the building deteriorated beyond the point of repair and was demolished in May of that year. James V. Lafferty attempted to replicate Lucy on a larger scale in Coney Island, New York. "Elephantine Colossus", as it was called, was built in 1884, measuring 122 feet in height, containing seven floors of exhibits and thirty-one rooms. Unlike the previous two elephant buildings, this one was solely intended as an attraction. Considerably larger than the previous two structures, "Elephantine Colossus" contained 3,500,000 feet of lumber, 11,000 kegs of nails, 12 tons of iron bolts, and was covered by 57,000 square feet of tin. But like "Light of Asia", it was not a financial success. The building was eventually sold and became a boarding house. By 1896, it was deserted. On September 27, 1896, the building caught fire and and was destroyed. Thanks for the research and the information.